This year (1980) will see everyone connected with railways celebrating the one hundred and fiftieth anniversary of the opening of the Liverpool and Manchester Railway - the first to be constructed specifically for the carriage of passengers as well as goods. After the construction of the great trunk lines and the Railway Mania of the 1840s, a period followed when proposed systems had at least a chance of paying dividends to their stockholders. These included the line which ran through Alresford. The Alton, Alresford and Winchester Railway, as was its title when the authorising Act received the Royal Assent, ran from an end-on connection at Alton Station to a junction with the London and Southampton Railway about two miles north of Winchester. A proposed branch from Ropley to a connection at Bishop's Waltham (which failed to materialise) caused the promoters to change its name to the Mid-Hants Railway. The route, running through what is now Four Marks; Ropiey, Alresford and Itchen Abbas, was fairly easy for a steam locomotive to work, except for the high ground at Four Marks (the station was named Medstead to begin with); there gradients of 1 in 60 were constructed in order to surmount the summit. This meant that heavy trains had to be 'double-headed'. The promoters, who included many prominent local landowners, gave two main reasons for building the railway. They considered it was necessary to open up the agricultural regions of the upper Wey and Itchen valleys; and after the difficulties of getting troops to the coast to embark for the Crimean War, the military authorities wanted a quick way to the ports of Southampton and Portsmouth and also the new Netley Military Hospital, from the South Camp at Aldershot, now in course of construction. The railway was authorised in 1851, and took four years to complete, but only after some initial opposition from the directors of the London and Southampton Railway, who feared loss of revenue from the fact that the distance from Waterloo to Southampton via Alresford is some miles shorter than that by way of Basingstoke. This animosity was to continue until the London and South Western Railway, as the main line company had now become, absorbed the Mid-Hants Railway in 1884. From the beginning the promoters of the new railway were ambitious of capturing large amounts of the London traffic, and the line was completed to take double track, as witness the bridges, embankments and cuttings to this day. However, money ran short and the only double track laid was in the passing loops in the stations. One economy which can still be seen was the mortaring of the walls of the stations exposed to the South westerly gales whilst the other more sheltered walls retained their plain brick appearance. Through trains from Waterloo to Southampton Terminus ran from the opening right up to 1937, when the tracks as far as Alton were electrified. leaving the Mid-Hants as a country railway running push-pull trains from Alton to the coast. 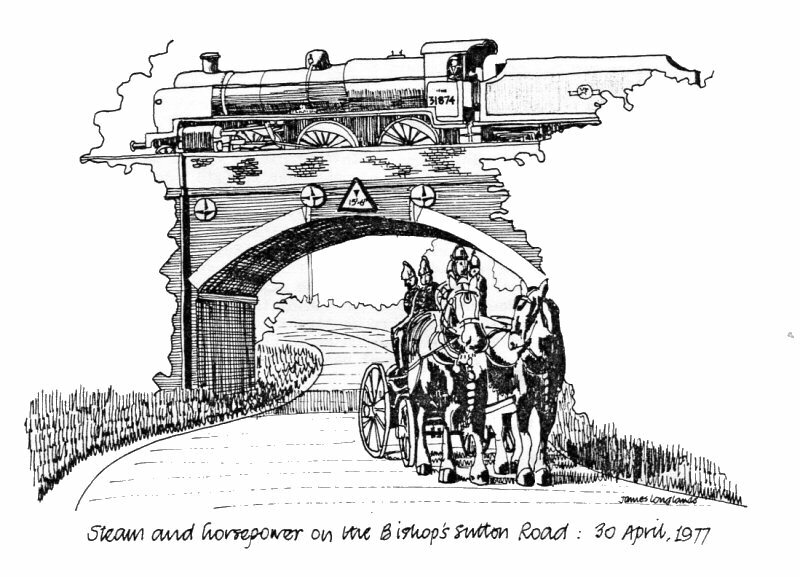 One direct result of the coming of the railway in the Alresford area was the setting up of the watercress industry (details may be found in Paper no.8), together with the carriage of livestock to and from the Alresford Sheep Fair, Mr. Yates' training stables at Bishop's Sutton, the H.H. kennels and local farms. Troops, as the Army had wanted, were carried in large numbers during the South African, the two World Wars and the 1957 Suez crisis from both Aldershot and Bordon. The railway was well patronised by passengers until the nineteen twenties, when road competition began to make serious inroads on receipts. Economies made in the early thirties resulted in Ropley and Itchen Abbas losing their staffs and passing loops, and a reduction in the number of trains run. When electrification reached Alton in 1937 the Southern Railway (as the main line had now become) appears to have intended the work to be extended through Alresford towards Southampton. However, the outbreak of war in 1939 meant that all railway expansion plans were abandoned and the Mid-Hants, like other lines, found itself, at the cessation of hostilities, in a very run down condition as a result of carrying the heavy wartime traffic without adequate maintenance. In 1957 diesel trains were introduced and caused an immediate upsurge of passenger traffic, which increased as Alresford and Four Marks experienced a sort of mini population explosion in the early nineteen sixties. When (the then) Dr. Beeching was appointed by the Government to report on the viability or otherwise of the whole net work across the country, he classified the Mid-Hants Railway as a 'grey' line, which meant that it was not recommended for closure until efforts had been made to make it work at a profit. At the same time the main line as far as Southampton and Bournemouth through Basingstoke had been authorised for electrification, and the route through Alresford proved to be an invaluable diversionary route for traffic which could be kept away from the engineers laying the third rail. Local people began to think that their railway's future was secure. However, as soon as electrification work was completed and the south coast trains resumed their normal route, notices were published Indicating that the railway would be closed in May, 1968. This provoked an immediate outcry, resulting in public meetings and a press and leaflet campaign against the proposed closure. The local councils, the two M.P.s through whose constituencies the railway ran, pressure groups of watercress and others, regular passengers and even the Ombudsman were involved in four public meetings and six years of campaigning to keep the railway open, all to no avail. The line closed in February, 1973, for all traffic. Now a preservation group is operating trains from Alresford to Ropley at summer weekends for tourists and enthusiasts. Its aim is to restore the railway into Alton Station, and to that end now owns all the formation of the line to that point. Steam engines and assorted rolling stock are being acquired and form, when not in use, an unusual background to the north side of the valley near Ropley. Astronomical cost, the threat of the motorway and the insurmountable difficulties of running steam trains into Winchester over an electrified line have all contributed to the decision to abandon the section from Alresford westwards. Already Itchen Abbas Station and yard have been sold for private development, and may soon resemble what is now becoming a common sight in many places - a disused station turned into an attractive dwelling place, with sunken garden or swimming pool fitting the space between the platforms.